Original is a vertical painting. Click to see full view. With his victory at Augusta, speculation grew that 1972 might be the year Jack Nicklaus would sweep the major championships. 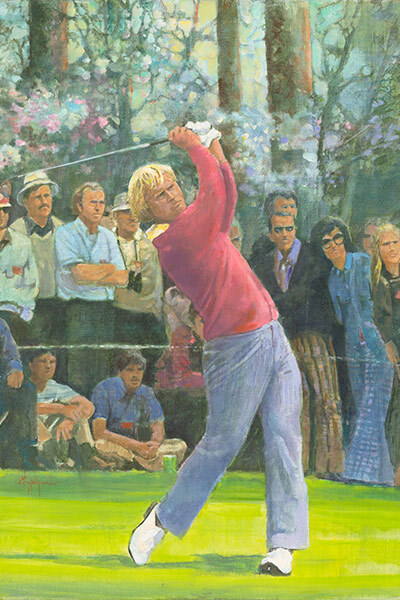 At the start of the 1972 season, 32-year-old Jack Nicklaus was arguably playing some of his best golf. He had already won 11 major championships (including two U.S. Amateurs) and the venues of that year’s four majors were places he felt comfortable. He had enjoyed success at aAugusta, Pebble Beach and Muirfield in Scotland, while Oakland Hills, the site of the PGA Championship, was a Donald Ross design similar to Scioto in Columbus, Ohio, where he had learned the game as a boy. At Augusta, Nicklaus led after an opening-round 68 and then held off the remarkable Sam Snead (age 59) to hold onto his lead, just as he would after the third round despite closing with two bogeys. His final-round 74 in difficult conditions was good enough for a two-stroke win and fourth green jacket. Now it was on to Pebble Beach and the second act of the drama.